Nathan and Alyza Lewin. Photo courtesy of Rikki Gordon Lewin. Menachem Zivotofsky was born in Shaare Zedek Hospital in Jerusalem. He was not born in Israel, at least according to the United States passport his American parents received after his birth. Menachem’s parents, who made aliya two years before his birth, disagree. They want Israel listed as his place of birth, and they hired the father-daughter legal team of Nathan Lewin and Alyza Lewin to make it happen. The case has been going on now for over a decade. At stake is not just one child’s passport but which branch of the American government has authority to recognize foreign governments. In 2002, when they founded Lewin & Lewin, Alyza made a prediction. “I said we would tend to be a magnet for all things Jewish,” she recalls, just as the Menachem Zivotofsky case illustrates. Given Nathan’s prominent reputation, it is hardly surprising. Over a 50-year career, his cases have been landmarks in religious accommodation, constitutional law, civil liberty, civil litigation and white-collar criminal defense. Nathan is known as a passionate advocate of Jewish causes, particularly Orthodox, although not everyone in the Jewish community agrees with his positions. He is willing to devote his considerable legal skills to years-long cases, without the recompense another legal direction might have reaped. “He is an icon in the Jewish community and the legal community,” says Richard Stone, immediate past chairman of the Conference of Presidents of Major American Jewish Organizations. “He has brought difficult legal cases to the attention of the world, an unbelievable service to the Jewish community.” Stone, a Columbia Law School professor, has been friends with Nathan since their days in the Justice Department in Washington, D.C., in the 1960s. The two-person law firm is located in a modest office in a high-rise building in downtown Washington. The reception area is tiny; the conference room bare bones except for framed drawings of the Lewins in court and antique photographs of Jerusalem. Nathan doesn’t act like a legal legend. Short and compact, with a neatly trimmed white beard and a halo of white hair topped by a dark-blue yarmulke, the 77-year-old talks quietly about his cases, his eyes shrewd behind wire-rimmed glasses. The Zivotofsky case began with a discrepancy. the general rule for American citizens born abroad is that their passport lists the country as their place of birth. “If born in Paris, it’s France; in Rome, Italy,” says Alyza. “If born in Tel Aviv or Haifa, it’s Israel.” The exception is Jerusalem, and the reason is that the State Department says its status needs to be negotiated with the Palestinians. Until then, America doesn’t recognize the city as being in Israel. In 2002, Congress passed legislation allowing Americans born in Jerusalem to list Israel as their country of birth. President George W. Bush signed the law but stated that it was only advisory and that Congress had interfered with the executive branch’s authority to recognize foreign governments. Zivotofsky was born a few weeks after the law was enacted. But when his parents asked the American Consulate in Jerusalem to list Israel as his place of birth, the answer was no. Since then, the case has been heard in the United States Supreme Court as well as the Court of Appeals for the District of Columbia Circuit. Now, it may be headed back to the top court. “Congress passed the law, the president said it was unconstitutional. We thought it was important the law be enforced,” Nathan says, explaining why he filed a petition for the Supreme Court to hear the case again and is waiting to hear if it will do so. Nathan estimates that as many as 75 percent of the firm’s cases are “Jewish,” although not all involve weighty issues. A civil suit between two Jewish kosher market-owners was a business issue. The partner in the Ernst & Young accounting firm who had been convicted in criminal court and whom Nathan represented on appeal happened to be Jewish, but the issue was tax law. Still, the firm gets a number of religious accommodation cases, like the Florida condominium owner who complained about a reneged promise for a Shabbat elevator or the Connecticut condominium owner who was told to remove the mezuza from her door even though other owners had Christmas symbols on theirs. Other clients are more high profile. The Lewins have represented Sholom Rubashkin, manager of Agriprocessors, the closed Iowa kosher meat packaging plant, in the appeal of his fraud conviction; and Agudas Chasidei Chabad, of the international Chabad-Lubavitch movement, in efforts to retrieve their library and archives seized by the Soviet Army after World War II. A boy in Israel was at the center of another Lewin case, one whose outcome was a landmark in antiterrorism litigation. David Boim was a 17-year-old American-born teenager who was shot to death by Hamas terrorists while standing at a bus stop in the West Bank. His parents asked Nathan if anything could be done in American courts. It turned out, there was. Nathan found an applicable law; the hitch was, it had never been used. The law said American citizens could sue international terrorists for damages and attorney fees, although who could be sued was not specified. In 2000, Nathan filed suit against American charities that provided financial aid to Hamas, the principal defendant being the Holy Land Foundation, then the largest Islamic charity in the country; the two terrorists who had killed Boim were themselves dead. Nathan argued that the charities had supported their acts of terrorism and could be held liable for damages. In other words, says Alyza, “you could go back along the causal chain,” a novel legal theory at the time. The Boims were awarded $156 million against the defendants but never collected a penny. In 2001, the government designated the Holy Land Foundation a terrorist organization, seized its assets and closed the charity. Over one million practicing attorneys have qualified to argue before the Supreme Court but few do. Nathan has done so 28 times, 12 when he worked in various capacities for the federal government and 16 in his private practice. One example is the American Israel Public Affairs Committee case. Known in the press as the AIPAC espionage scandal, it erupted in mid-2000 when federal agents charged two of its employees with disclosing classified information. Philip Friedman, AIPAC’s lawyer, didn’t hesitate. In a case that he saw as a threat to American Jews’ advocacy for Israel, he hired Nathan for AIPAC. “He was the only person to call because he is intimately familiar with the Jewish community and of the rights we have as American citizens. We needed a champion,” says Friedman. The two AIPAC employees hired their own attorneys. The government eventually dropped the charges. More recently, in 2012, three days before a championship basketball tournament, the Lewins got a call from the Robert M. Beren Academy, an Orthodox Jewish boys’ school in Houston whose team had qualified. Citing its bylaws, the Texas Association of Private and Parochial Schools, which oversees nonpublic schools’ athletics, refused to change the schedule of the semifinals on a Friday night and the finals on a Saturday night. “We filed a federal lawsuit,” says Alyza. “Within three hours, TAPPS backed down.” The association not only rescheduled the semifinals but agreed to change the time of the Saturday finals to post-Shabbat if Beren advanced. The team did, but lost by four points. Several months later, TAPPS changed its bylaws. A footnote to the Beren Academy case: Several parents and members of its board didn’t want to challenge TAPPS, preferring not to make a fuss. That’s not the Lewin way. To Nathan, that means taking positions not necessarily popular in the American Jewish community. “There tends to be a bit of disagreement between the Orthodox and the [general] Jewish community over separation of church and state,” he says of his stands in favor of religious displays on public property and federal funding to teachers of secular subjects in Jewish day schools, among others. His latest disagreement, however, involves Orthodox groups challenging a New York City health department regulation that a mohel who conducts oral suction at a bris needs signed parental consent. “I thought [the regulation] was entirely reasonable and the lawsuit should not have been brought,” says Nathan. “I’ve gotten a lot of flak” about it. 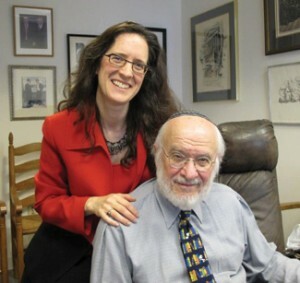 The Lewins’ activism extends to the many Jewish organizations to which they belong and lead. Nathan has been president of the Jewish Community Council of Greater Washington; founding member and vice president of the National Jewish Commission on Law and Public Affairs, a volunteer group that works on behalf of Orthodox Jewish causes; president of the American Section of the International Association of Jewish Lawyers and Jurists; and honorary president of its successor, the American Association of Jewish Lawyers and Jurists. Alyza is currently president of the American Association of Jewish Lawyers and Jurists. She is a board member of the Jewish Community Council of Greater Washington. Alyza is a life member of Hadassah, and Nathan is a member of Hadassah Associates. Nathan is a Holocaust survivor, born in 1936 in Lodz, Poland. His father had been elected the youngest member of the city council, but his mother, who was raised in Amsterdam, had a premonition. “She made my father promise that if Hitler marched into Poland, we’d head off in the other direction,” says Nathan, whose family was smuggled into Lithuania, managed to get visas to Japan from Chiune Sugihara at the Japanese consulate in Kovno and arrived in the United States in 1941. A graduate of Yeshiva College and Harvard Law School, Nathan lives in Potomac, Maryland, with his wife of 51 years, Rikki Gordon Lewin, a photographer. They have two daughters, Alyza and Na’Ama, and six grandchildren. They belong to three Orthodox congregations: Beth Sholom and Chabad Shul, both in Potomac, and Kesher Israel, in Georgetown. Nathan teaches a Talmud class several times a week and a Shabbat class at Beth Sholom. Alyza graduated from Princeton University and New York University Law School. She lives in Washington with her husband of 20 years, Eliezer Halbfinger, an information technology consultant. They have four children ages 7 to 17; all attend the Berman Hebrew Academy in Rockville, Maryland. The family belongs to Kesher Israel. The Lewins don’t win all their cases. But then, in the quiet of the conference room, Alyza talks about Boim, whose death led, years later and thousands of miles away, to a Chicago courtroom two weeks after the 9/11 terrorist attack. Not only did the Lewins win the case, it set a precedent that victims of 9/11 and other acts of terrorism have subsequently used. i would like to have access to whatever contract/wording/paragraph/paperwork can protect my daughter against a husband deciding to NOT give a get and to hold her prisoner demanding huge sums of money…. it’s interesting because for my son I would advise never signing such a paper because he could withhold a get to insure a divorce was normal and a mean wife did not unfairly grab every penny he had and ever would have…he would NEVER use a get to harm a wife….but only to protect himself from a mean vicious divorce….he himself is kind generous polite nice sweet so the wife would not need to be protected against him in anyway….only he would need to be protected should she be extremely mean and vicious. so its interesting that SOME men should refuse to sign such a paper so that they are protected…I guess the paper is useful against mean vicious men who would harm them (and there are plenty of them around) and yet….for some men (just some) those men need to be protected from a mean wife with good (mean vicious) lawyers hurting and harming a sweet harmless husband so I need some appropriate lawyer to send me the paperwork to protect my daughter when she gets married…..